In 1882 the formation of dog breed clubs was a popular but fairly new concept and the clubs that had been formed were still in their infancy (even The Kennel Club was in its first blossom of youth). 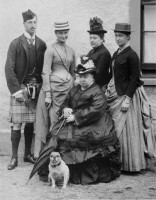 Many old established breeds were actively considering establishing their own clubs, including the fanciers of Pugs. The popular way for clubs to report news and progress was by notice in the Kennel Gazette or in the Stock Keeper and Fancier’s Chronicle. 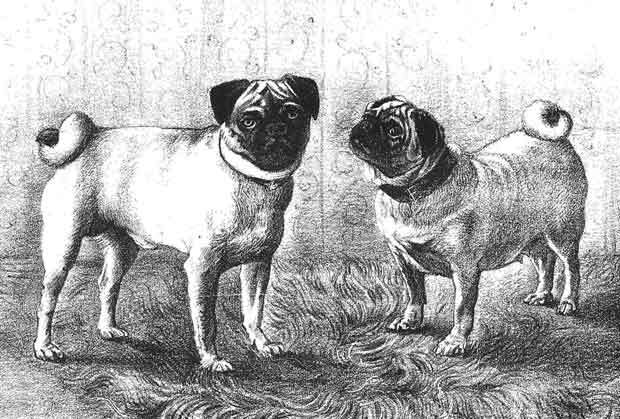 Following a notice published on 29 December 1882 addressed to Pug breeders and enthusiasts, a preliminary meeting was set for 16 January 1883. This took place at The Crystal Palace and was chaired by Mr J W Berrie. A committee was formed. The following day this group re-assembled, nominated an Hon. Secretary and Treasurer, set the annual subscription at one guinea and called a further meeting for 23 January to present proposed club rules and objectives. These were duly presented and accepted. A fourth and final meeting of the group, the inaugural General Meeting, took place on 7 March at The Horseshoe Hotel, Tottenham Court Road, London. Mr J W Berrie was elected club President and Mrs M Holdsworth, the first lady ever to judge at dog shows, was the secretary. The founding date of the club is given as 16 January 1883 at the Kennel Club but it could be open to interpretation up to 7 March that year. The March 1883 edition of the Kennel Gazette published the rules and Breed Standard of the newly formed Pug Dog Club. In 1894 a rival Club, The Universal Pug Dog Club, was formed, later to be re-named The London and Provincial Pug Club. Although we have no full set of founding rules, they must have been much the same apart from this club having restricted membership. Both clubs worked to the same breed standard but by this time black pugs were firmly established as part of the show scene. Both clubs ran in parallel, not always in complete harmony, until 1926 when they amalgamated into the single Pug Dog Club that exists today. Over this period of time fashions and regulations have changed, we hope for the better. The main objective of today’s club is to promote the breeding of pugs according to the Kennel Club Breed Standard and to do all in it’s power to protect and advance the interest of the breed. The first Pug Dog Club show was held in 1885. The club now runs three shows each year, a Championship show and two Open shows. Club spoons are awarded to CC winners provided the judge is on the Pug Breed Council judging lists. The Club owns a large collection of cups and trophies – some of them very valuable. Today’s committee is formed of ten members, a President, a Treasurer, a Show Secretary and a Secretary, who meet five times a year. Committee members are elected annually. The President is also elected by the members and their term of office is three years. The other officers are elected by the committee. Two members of the committee represent the Club on the Pug Breed Council, which compiles and approves the judges’ lists. In 2005, a health subcommittee was formed to look into all health issues in the breed.